Merle Haggard topped the chart with one of his best-known songs, "The Fightin' Side of Me". Hot Country Songs is a chart that ranks the top-performing country music songs in the United States, published by Billboard magazine. In 1970, 23 different singles topped the chart, then published under the title Hot Country Singles, in 52 issues of the magazine, based on playlists submitted by country music radio stations and sales reports submitted by stores. In the issue of Billboard dated January 3, 1970, "Baby, Baby (I Know You're a Lady)" by David Houston replaced Charley Pride's "(I'm So) Afraid of Losing You Again" at number one, where it remained until the January 31 issue, when it was replaced by "A Week in a Country Jail" by Tom T. Hall. Hall had achieved success as a songwriter, including penning the song "Harper Valley PTA" which had been both a pop and country number one for Jeannie C. Riley in 1968, but "A Week in a Country Jail" was his first number one as a performer. Husband-and-wife duo Jack Blanchard & Misty Morgan also reached number one for the first and only time with "Tennessee Bird Walk", as did Dave Dudley with "The Pool Shark". Lynn Anderson also topped the chart for the first time with "Rose Garden", which was also a major crossover hit, reaching the top five of Billboard's all-genres chart, the Hot 100. Hank Williams Jr., the son of the legendary country singer Hank Williams, achieved the first number one of a career which would span more than fifty years when he collaborated with the Mike Curb Congregation on the single "All for the Love of Sunshine". Sonny James spent the most weeks at number one of any artist, his four chart-toppers totalling fourteen weeks in the top spot. "It's Just a Matter of Time", "My Love", "Don't Keep Me Hangin' On" and "Endlessly" formed part of a streak of sixteen consecutive number ones for James, which ran from 1967 until 1971. Three other artists took multiple singles to number one during 1970. Charley Pride had three chart-toppers totalling six weeks at number one, the highest total after the fourteen achieved by James, and Conway Twitty and Tammy Wynette each achieved two number ones. The final number one of the year was "Rose Garden" by Lynn Anderson, which went to number one in the issue of Billboard dated December 26 to begin a run which would last until the issue dated January 30, 1971. Tom T. Hall had his first number one in 1970 with "A Week in a Country Jail". Sonny James spent a total of 14 weeks at number one during the year. Conway Twitty topped the chart with "Hello Darlin'", which came to be regarded as his signature song. 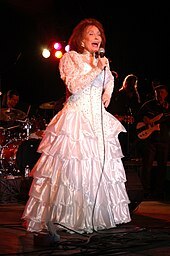 Loretta Lynn (pictured in 2005) reached number one with the autobiographical "Coal Miner's Daughter". "Baby, Baby (I Know You're a Lady)"
"A Week in a Country Jail"
"The Fightin' Side of Me"
"Is Anybody Goin' to San Antone"
"My Woman My Woman My Wife"
"He Loves Me All the Way"
"Wonder Could I Live There Anymore"
"All for the Love of Sunshine"
"There Must Be More to Love Than This"
"I Can't Believe That You've Stopped Loving Me"
^ Bernstein, Jonathan (December 23, 2014). "Flashback: Merle Haggard Reluctantly Unveils 'The Fightin' Side of Me'". Rolling Stone. Retrieved March 19, 2018. ^ Whitburn, Joel (2005). Joel Whitburn's Top Country Songs: 1944-2005. Record Research. p. ix. ISBN 9780898201659. ^ a b "Hot Country Songs chart for January 3, 1970". Billboard. Retrieved March 20, 2018. ^ "Story Behind the Song: Jeannie C. Riley, 'Harper Valley PTA'". The Boot. Townsquare Media. February 5, 2016. Retrieved March 19, 2018. ^ Spivey, Julian (April 9, 2015). "Tom T. Hall's 10 best songs". AXS TV. Retrieved March 19, 2018. ^ "Jack Blanchard & Misty Morgan Chart History". Billboard. Retrieved March 19, 2018. ^ Nolan-Wilson, Donna (March 31, 2015). "Top 10 Dave Dudley songs". AXS TV. Retrieved March 19, 2018. ^ Huey, Steve. "Lynn Anderson Biography & History". AllMusic. Retrieved March 19, 2018. ^ Thompson, Gayle (December 26, 2016). "46 Years Ago: Lynn Anderson's 'Rose Garden' Hits No. 1 - The Boot". The Boot. Townsquare Media. Retrieved March 19, 2018. ^ Betts, Stephen L. (October 26, 2016). "Hank Williams Jr.'s Biggest Hits Collected in Expansive Box Set". Rolling Stone. Retrieved March 19, 2018. ^ Erlewine, Stephen Thomas. "Hank Williams, Jr. Biography & History". AllMusic. Retrieved March 19, 2018. ^ Betts, Stephen L. (February 22, 2016). "'Young Love' Singer Sonny James Dead at 87". Rolling Stone. Retrieved March 19, 2018. ^ "Hot Country Songs chart for January 30, 1971". Billboard. Retrieved March 19, 2018. ^ "10 Best '70s Songs". Taste of Country. Townsquare Media. October 29, 2011. Retrieved March 19, 2018. ^ Betts, Stephen L.; Freeman, Jon; Reed, James; Rodman, Sarah (April 14, 2016). "Loretta Lynn: 20 Essential Songs". Rolling Stone. Retrieved March 19, 2018. ^ "Hot Country Songs chart for January 10, 1970". Billboard. Retrieved March 20, 2018. ^ "Hot Country Songs chart for January 17, 1970". Billboard. Retrieved March 20, 2018. ^ "Hot Country Songs chart for January 24, 1970". Billboard. Retrieved March 20, 2018. ^ "Hot Country Songs chart for January 31, 1970". Billboard. Retrieved March 20, 2018. ^ "Hot Country Songs chart for February 7, 1970". Billboard. Retrieved March 20, 2018. ^ "Hot Country Songs chart for February 14, 1970". Billboard. Retrieved March 20, 2018. ^ "Hot Country Songs chart for February 21, 1970". Billboard. Retrieved March 20, 2018. ^ "Hot Country Songs chart for February 28, 1970". Billboard. Retrieved March 20, 2018. ^ "Hot Country Songs chart for March 7, 1970". Billboard. Retrieved March 20, 2018. ^ "Hot Country Songs chart for March 14, 1970". Billboard. Retrieved March 20, 2018. ^ "Hot Country Songs chart for March 21, 1970". Billboard. Retrieved March 20, 2018. ^ "Hot Country Songs chart for March 28, 1970". Billboard. Retrieved March 20, 2018. ^ "Hot Country Songs chart for April 4, 1970". Billboard. Retrieved March 20, 2018. ^ "Hot Country Songs chart for April 11, 1970". Billboard. Retrieved March 20, 2018. ^ "Hot Country Songs chart for April 18, 1970". Billboard. Retrieved March 20, 2018. ^ "Hot Country Songs chart for April 25, 1970". Billboard. Retrieved March 20, 2018. ^ "Hot Country Songs chart for May 2, 1970". Billboard. Retrieved March 20, 2018. ^ "Hot Country Songs chart for May 9, 1970". Billboard. Retrieved March 20, 2018. ^ "Hot Country Songs chart for May 16, 1970". Billboard. Retrieved March 20, 2018. ^ "Hot Country Songs chart for May 23, 1970". Billboard. Retrieved March 20, 2018. ^ "Hot Country Songs chart for May 30, 1970". Billboard. Retrieved March 20, 2018. ^ "Hot Country Songs chart for June 6, 1970". Billboard. Retrieved March 20, 2018. ^ "Hot Country Songs chart for June 13, 1970". Billboard. Retrieved March 20, 2018. ^ "Hot Country Songs chart for June 20, 1970". Billboard. Retrieved March 20, 2018. ^ "Hot Country Songs chart for June 27, 1970". Billboard. Retrieved March 20, 2018. ^ "Hot Country Songs chart for July 4, 1970". Billboard. Retrieved March 20, 2018. ^ "Hot Country Songs chart for July 11, 1970". Billboard. Retrieved March 20, 2018. ^ "Hot Country Songs chart for July 18, 1970". Billboard. Retrieved March 20, 2018. ^ "Hot Country Songs chart for July 25, 1970". Billboard. Retrieved March 20, 2018. ^ "Hot Country Songs chart for August 1, 1970". Billboard. Retrieved March 20, 2018. ^ "Hot Country Songs chart for August 8, 1970". Billboard. Retrieved March 20, 2018. ^ "Hot Country Songs chart for August 15, 1970". Billboard. Retrieved March 20, 2018. ^ "Hot Country Songs chart for August 22, 1970". Billboard. Retrieved March 20, 2018. ^ "Hot Country Songs chart for August 29, 1970". Billboard. Retrieved March 20, 2018. ^ "Hot Country Songs chart for September 5, 1970". Billboard. Retrieved March 20, 2018. ^ "Hot Country Songs chart for September 12, 1970". Billboard. Retrieved March 20, 2018. ^ "Hot Country Songs chart for September 19, 1970". Billboard. Retrieved March 20, 2018. ^ "Hot Country Songs chart for September 26, 1970". Billboard. Retrieved March 20, 2018. ^ "Hot Country Songs chart for October 3, 1970". Billboard. Retrieved March 20, 2018. ^ "Hot Country Songs chart for October 10, 1970". Billboard. Retrieved March 20, 2018. ^ "Hot Country Songs chart for October 17, 1970". Billboard. Retrieved March 20, 2018. ^ "Hot Country Songs chart for October 24, 1970". Billboard. Retrieved March 20, 2018. ^ "Hot Country Songs chart for October 31, 1970". Billboard. Retrieved March 20, 2018. ^ "Hot Country Songs chart for November 7, 1970". Billboard. Retrieved March 20, 2018. ^ "Hot Country Songs chart for November 21, 1970". Billboard. Retrieved March 20, 2018. ^ "Hot Country Songs chart for November 28, 1970". Billboard. Retrieved March 20, 2018. ^ "Hot Country Songs chart for December 5, 1970". Billboard. Retrieved March 20, 2018. ^ "Hot Country Songs chart for December 12, 1970". Billboard. Retrieved March 20, 2018. ^ "Hot Country Songs chart for December 19, 1970". Billboard. Retrieved March 20, 2018. ^ "Hot Country Songs chart for December 26, 1970". Billboard. Retrieved March 20, 2018. This page was last edited on 20 March 2018, at 21:40 (UTC).